Let's look at what each step involves. A chemical (coagulant) is added to the untreated raw water and reacts with impurities such as small particles and dissolved organic matter. The coagulant traps the suspended particles and much of the dissolved organic material. The success of the treatment process very much depends on successful coagulation and SA Water is investing in the latest instrumentation to help maximise coagulation effectiveness. Water and suspended flocs pass slowly through sedimentation basins or clarifiers, where most of the floc settles to the bottom as a sludge. The clarified water (now containing only a small amount of very fine floc particles) continues on to the filters. The sludge is periodically removed from the basins for further treatment and disposal. An alternative technique called Dissolved Air Floatation (DAF) is used at the Myponga Water Treatment Plant. This uses fine air bubbles to float floc to the surface to form a sludge blanket, which is periodically removed by overflowing the floatation tanks. 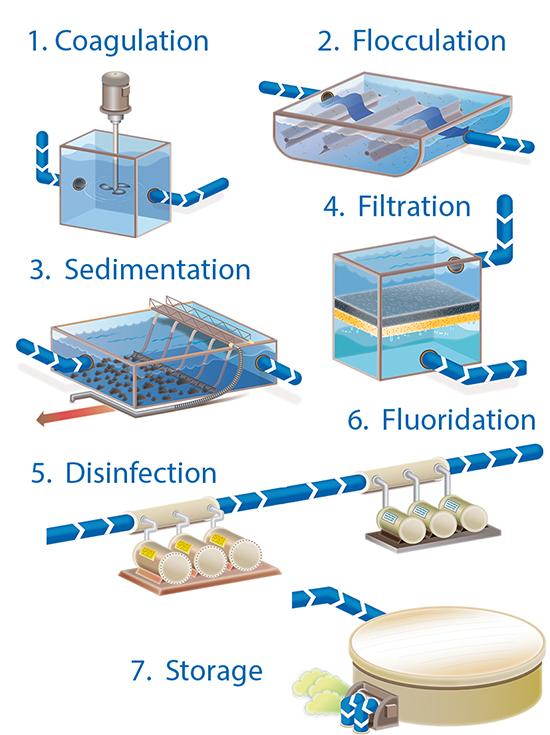 The remaining floc particles are removed by passing the clarified water through filtration media. The most common filters at the larger water treatment plants are deep beds of sand or a combination of sand and anthracite. In our newer and smaller water treatment plants, the final filtration step is achieved by forcing the clarified water through synthetic membranes. A chemical disinfectant is generally added at a point between the filters and the filtered water storage tank, to destroy any microorganisms that may not have been removed in the earlier flocculation and filtration stages. 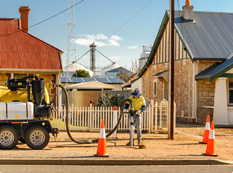 In South Australia, chlorine is the disinfectant of choice for supply systems with relatively short detention times of a day or two, while chloramine (produced by reacting chlorine and ammonia) is used in supply systems with longer pipeline infrastructure. Disinfection sometimes requires the pH of the water to be adjusted to enhance the performance of the disinfectant. In some applications, ultraviolet (UV) light is used to complement chemical disinfection. Fluoride is then added on behalf of the SA Department of Health and Ageing in order to provide a significant public health benefit. 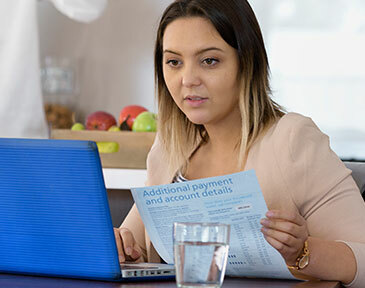 Fluoride does not affect the appearance, taste or odour of drinking water and is controlled to ensure levels comply with the Australian Drinking Water Guidelines. Drinking water can then be stored in storage tanks. Tanks are strategically located to deliver water more effectively during peak usage times.